This is the perfect family dinner for Good Friday – a simple recipe packed with flavour, quick and easy to prepare. Add in the tagliatelle and cook according to the packet instructions. Cut the salmon darnes into bite size chunks. Meanwhile heat a large shallow saucepan with a little oil. Add in the leeks and mushrooms and continue to cook gently until they are softened. Next add in the white wine (if you are not using the wine, replace with an extra 2floz/50ml stock) and allow this to sizzle for a minute or two. Next pour in the chopped tomatoes and stock and allow this mixture to come to the boil. Add in the diced salmon and cook for 4-5 minutes until the salmon is just cooked through. Reduce the heat and season lightly with salt and pepper. Mix in the natural yoghurt which will add an element of creaminess to the sauce. 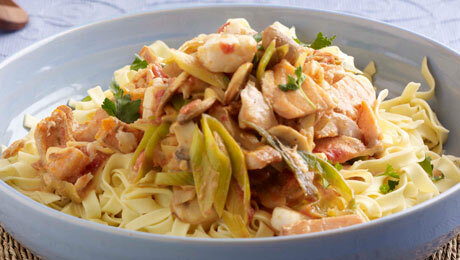 Strain off the tagliatelle and add this into the creamy sauce and mix gently until it is lightly bound together. Serve immediately. If you can’t access fish stock you can add in some lightly flavoured chicken stock also.